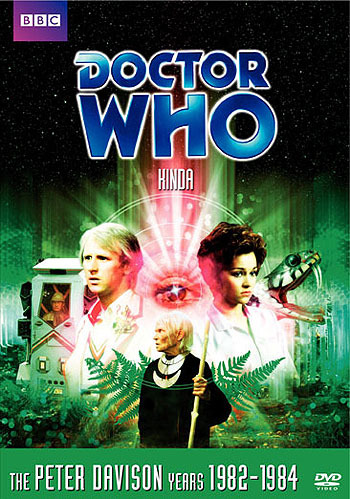 The TARDIS visits the planet Deva Loka, where Nyssa remains behind in the ship to recover from a mild mental disorientation while the Doctor, Tegan and Adric explore. Tegan falls asleep under some wind chimes and becomes possessed by an evil force, a Mara. Commentary - stereo. With actors Peter Davison, Janet Fielding, Matthew Waterhouse and Nerys Hughes. Dream Time (dur. 34' 05") - cast and crew look back at the making of the story. With actors Janet Fielding, Nerys Hughes, Simon Rouse and Adrian Mills, director Peter Grimwade, writer Christopher Bailey, script editors Christopher H. Bidmead, Eric Saward and Antony Root, designer Malcolm Thornton, new series writer Robert Shearman. Peter Grimwade - Directing with Attitude (dur. 22' 57") - a look at the Doctor Who career of writer and director Peter Grimwade. With Peter Grimwade, actors Janet Fielding and Nerys Hughes, writer Christopher Bailey, script editor Eric Saward, production assistant Margot Hayhoe, designer Malcolm Thornton, production secretary Jane Judge, script consultant Ian Levine, and Target Books editor Nigel Robinson. Presented by Mark Strickson. Deleted and Extended Scenes (dur. 14' 36") - a fascinating collection of deleted sequences taken from timecoded domestic videotape copies of the story's early edits. CGI Effects Comparison (dur. 1' 34") - a side by side comparison of the original puppet and new CGI snake shots. Trails & Continuity (dur. 4' 13") - BBC trails and continuity announcements from the story's original transmission. Photo Gallery (dur. 4' 42") - production, design and publicity photos from the story. Isolated Music - option to watch the story with the isolated music score.